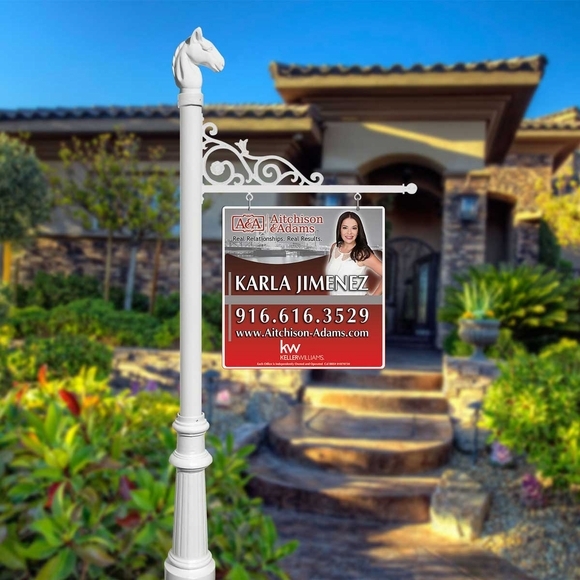 Custom Real Estate Sign System - - attention-grabbing Real Estate sign adds a new level of curb appeal to For Sale properties. You provide the hanging sign. Sign not included. Sign system comes with decorative finial and base and scroll arm ready for your own hanging House For Sale signs. Perfect for professional Realtors. Post is a total of 72" for the in ground mount. Goes into ground at least a foot and a half, meaning it will stick up out of the ground approx. 4.5' not including the finial. For both mount types, height above ground will be approx. 4.5' not including the finial.